This handbook is intended for use by designers of highly complex electronic systems for military, aerospace, medical, telecommunications or any industry where an accurate assessment of reliability is needed and can be verified through testing. The publication represents the results of over seven years of research at the University of Maryland, College Park in collaboration with Tel Aviv University and Bar Ilan University in Israel. 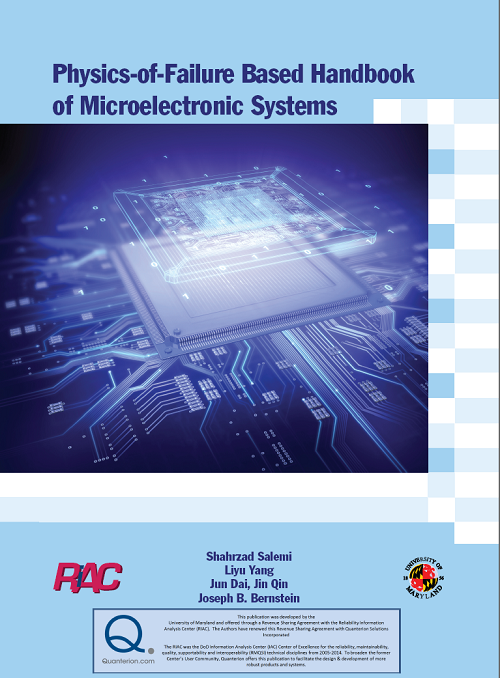 The authors are proud to present this unique approach for electronic system reliability assessment and qualification based on physics-of-failure. The book describes the work that had been funded through the AVSI Aerospace Consortium run out of Texas A&M University, the Office of Naval Research, the US Department of Defense (DoD) and the Reliability Information Analysis Center (RIAC). The handbook illustrates a straightforward and common sense approach to reliability assessment that combines the well-known property of constant rate failures that industry observes in the field with the mostly academic approach of physics-of-failures evaluation. Simply stated, the Authors have developed a system by which a reliability engineer can take data from accelerated life testing that addresses only a single mechanism, by design, and relate it to the proportion of constant rate failures that are observed in the field. Then, the results of both field data and test data can be used in order to more properly model the expected lifetime behavior of electronics as they operate under specified conditions. Copyright © January 2008 by The Center for Reliability Engineering, University of Maryland, College Park, Maryland, USA.